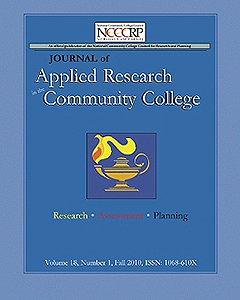 The Journal of Applied Research in the Community College - Welcome Scholars! 1. NOTICE: New Forums Press ceases publication of this Journal in 2014 with the completion of volume 21. Beginning with volume 22, the Journal will be published through a joint venture between the Ed.D. program in Community College Leadership at San Diego State University (SDSU) and the SDSU Community College Leaders Alumni Chapter. This semi-annual refereed journal publishes articles relating to such issues as detailing the objectives, methods, and findings of studies conducted to assess student outcomes, evaluating programs and services, and projecting the impacts of proposed legislation. Communicates innovative practices in applied research that supports educational and administrative decision-making at the institutional, state, and national levels. This semi-annual refereed journal publishes articles relating to such issues as detailing the objectives, methods, and findings of studies conducted to assess student outcomes, evaluating programs and services, determining community educational needs, and projecting the impacts of proposed legislation. It attempts to provide information needed by those setting educational and administrative policy for community colleges. Such articles not only give insight into present and future policy issues but also describe the methods and models used by the researchers so they may be replicated by other educators. This journal is invaluable in keeping abreast of the challenges community colleges face! Price of annual subscription is $35; request information about bulk subscriptions and back issues.